The 93-unit Vibrant! development at NW 14th & Raleigh has opened. The building includes 40 units dedicated to formerly homeless individuals and families, with the rest of the 93 units available to those earning 30, 50 and 60 percent of area median income. The 12-story Vibrant! 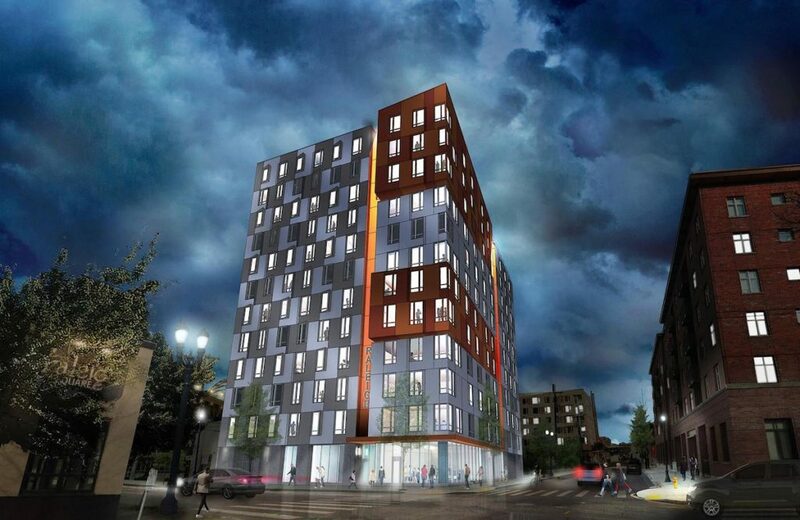 affordable housing development opened in the Pearl*, reports the Daily Journal of Commerce. The quarter block tower was designed by Salazar Architect and LRS Architects for Innovative Housing Inc.
Multnomah County celebrated the opening of the Gladys McCoy Health Department Headquarters. The Portland Timbers website published “Soccer and Witchcraft“, an interview architect Brad Cloepfil of Allied Works about designing the Providence Park Expansion. A dedication ceremony was held for the skybridge which connects the OHSU Center for Health and Healing South to the original building, reports the Portland Business Journal. The bridge is dedicated to former OHSU patient Rhoni Wiswall, who passed away from pancreatic cancer. This entry was posted in Allied Works Architecture, Innovative Housing, LRS Architects, Multnomah County Health Department HQ, NW 14th & Raleigh, Providence Park Expansion, Salazar Architects, weekly roundup. Bookmark the permalink.